Heavy earrings can tear the skin and leave an unattractive "line." 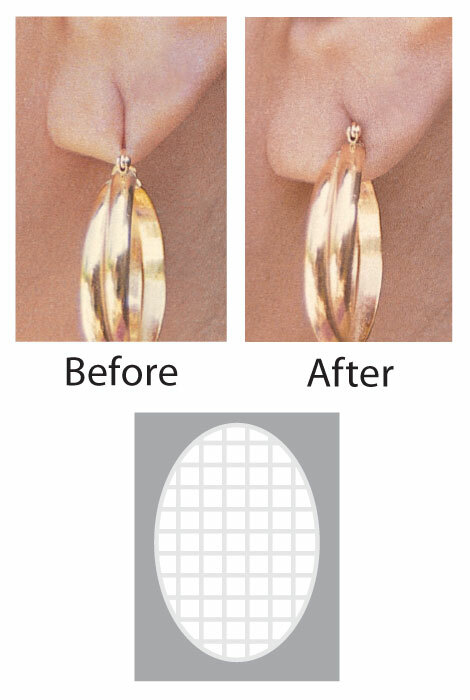 Earring Support Patches are clear hypo-allergenic patches that apply to the back of your earlobe, bearing the weight of the earring. Imported. 120 single use patches. I love these lobe wonders...now my earrings look even...before one earing was higher than the other because of a slit ear lobe. I was skeptical, but willing to try something to protect my pierced earlobes from heavy earrings. These dots do indeed hold the weight of the earrings. They are a little awkward to learn to use, but I am now applying them quickly every day and I am pleased with their function. I love modern jewelry and was unable to wear anything except studs until I found this product. For really heavy earrings I double them. Very happy I can wear all of my earrings now. These Lobe Wonders are really a wonder! I can actually wear my heavy earrings again. Lobe Wonders are a part of my wardrobe! With Lobe Wonders, I never have to worrry about losing earrings. I use these every day! They are the best thing I've ever put on my ears. I can wear any earrings now and I don't get sore, tired ears or infections because the earrings are not 14k gold. These are great! These little clear stickers allow me to continue wearing my collection of earbobs! This product performs precisely as advertised. With one ripped piercing I can wear the earrings I want without fearing that the hole will sag or rip further. These are great at preventing further elongation of my earring "holes". I have already torn an earlobe and these are great for even the heaviest of earrings. I have used these for years and don't know what I would do without them! I have recommended them to countless friends with the same "aging" ear holes! I am using this product to help with the holes in my ears. It is really working very well. I am happy with the product and I highly recommend it to anyone that may have an enlarge hole to have been using heavy and large earrings. From years of holding the phone up to my left ear with earrings on my piercing has stretched. This product makes even my heaviest earrings hang perfectly! You would think that a small adhesive patch would be easy to position on the back of one's ear. Wrong! Despite spending a good 15 minutes trying to use the lobe patches, I was unable to get them to work their magic. The holes in my ears still looked like slits and the earring wires still fell to the bottom of the slits. They do not bear the weight of the earring as advertised. Excellent product ! takes the weight off of your ear lobe you will love this! worn them for years. Work great! Love Lobe Wonder. My ear lobes are so stretched out from wearing heaving hoop earrings that I needed something to keep earrings in place. Use them every day.!! I find them very helpful for me. I have used them for years, With one torn lobe,courtesy of my youngest child, I can only wear larger earrings when using these. They are very helpful at reducing pain and further enlarging of the hole. one of my ear lobe is too large. For years I slept in my earrings on one side and now the hole in my ear has stretched. This will solve the problem on that side and now I won't lose my earrings. I really need something like this and am thrilled to see them and really hope they work!!! had these years ago and loved them. Just remembered them and want more.. couldn't fnd them in the stores. so here I am.. I am an earring Diva with 74 old ear lobes. This is the first time I've seen such a product and want to use earrings that I've put aside for years bec. of their weight. I'm hoping this will allow me to enjoy them again. Used before and very happy with product. I have one ear that needs more support in order to wear heavier earring! Use them all the time. They are great! patches are great for any elongated line on ear. always tried different brands, trying this one now. My diamond earrings used to hang downward. I tried these and they work great. Now my diamonds stand up and sparkle! Never knew anything like this existed - but I'm glad they do! Very easy to use and definitely works! I love this product and have used it for years. have used this item before, keeps my ears from being sore with heavier earrings.